families of styles, penhold and shakehand. 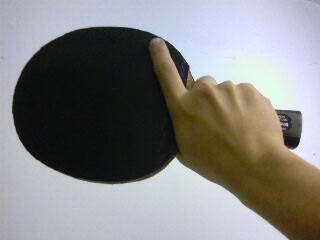 The rules of table tennis do not prescribe the manner in which one must grip the racket, and numerous grips are employed. The penhold grip is so-named because one grips the racket similarly to the way one holds a writing instrument. The style of play among penhold players can vary greatly from player to player. The most popular style, usually referred to as the Chinese penhold style, involves curling the middle, ring, and fourth finger on the back of the blade with the three fingers always touching one another. Chinese penholders favour a round racket head, for a more over-the-table style of play. In contrast, another style, sometimes referred to as the Korean penhold grip, involves splaying those three fingers out across the back of the racket, usually with all three fingers touching the back of the racket, rather than stacked upon one another. Sometimes a combination of the two styles occurs, wherein the middle, ring and fourth fingers are straight, but still stacked, or where all fingers may be touching the back of the racket, but are also in contact with one another. Korean penholders will often use a square-headed racket for an away-from-the-table style of play. Traditionally these square-headed rackets feature a block of cork on top of the handle, as well as a thin layer of cork on the back of the racket, for increased grip and comfort. Penhold styles are popular among players originating from East Asian regions such as China, Taiwan, Japan, and South Korea. Traditionally, penhold players use only one side of the racket to hit the ball during normal play, and the side which is in contact with the last three fingers is generally not used. This configuration is sometimes referred to as "traditional penhold" and is more commonly found in square-headed racket styles. However, the Chinese developed a technique in the 1990s in which a penholder uses both sides of the racket to hit the ball, where the player produces a backhand stroke (most often topspin) by turning the traditional side of the racket to face one's self, and striking the ball with the opposite side of the racket. This stroke has greatly improved and strengthened the penhold style both physically and psychologically, as it eliminates the strategic weakness of the traditional penhold backhand. The shakehand (or shakehands) grip is so-named because the racket is grasped as if one is performing a handshake. Though it is sometimes referred to as the "tennis" or "Western" grip, it bears no relation to the Western tennis grip, which was popularized on the West Coast of the United States in which the racket is rotated 90 degrees, and played with the wrist turned so that on impact the knuckles face the target. 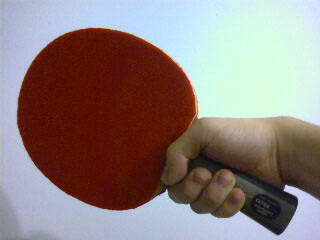 In table tennis, "Western" refers to Western nations, for this is the grip that players native to Europe and the Americas have almost exclusively employed. The shakehand grip's simplicity and versatility, coupled with the acceptance among top-level Chinese trainers that the European style of play should be emulated and trained against, has established it as a common grip even in China. Many world-class Asian players currently use the shakehand grip, and it is generally accepted that shakehands is easier to learn than penholder, allowing a broader range of playing styles both offensive and defensive.